The men’s varsity volleyball team defeated the Clark Chargers in three sets, 25-9, 25-22 and 25-21 in an away game on Tuesday, March 26. Freshman Jacob Ceci (#7) had seven kills while senior Brian Wightman (#14) contributed with five aces. 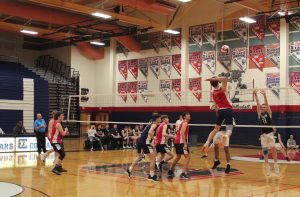 Varsity won 25-19, 25-20 and 25-17 against the Silverado Skyhawks at home on Wednesday, March 27. Junior Alex Winiarczyk (#9) and Ceci each had 12 kills for the Cougs. Seniors Andrew Corales (#1) and Alex White (#3) had 21 and 12 digs respectively. White also contributed to varsity’s victory with 32 assists and three blocks. 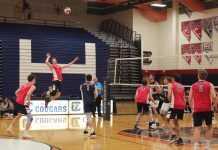 Men’s volleyball is 4-0 in league and 14-7 overall. They play today at 6:00 p.m. at Sierra Vista and again at home on Wednesday, April 3 against Spring Valley. In the second home game of the week, varsity softball defeated Sierra Vista 4-2 on Wednesday, March 27. Senior Madison Stephens (#8) and Sinicki made two RBI’s. In the final away game of the week, the Cougars defeated SECTA 15-0 on Friday, March 29. Sinicki had two home runs and senior Madison Stephens (#18) had one home run and RBI. 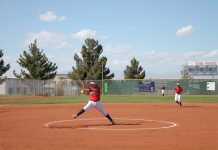 Varsity softball plays Silverado again at 3:30 p.m. at home on Tuesday, April 2. The men’s varsity baseball team defeated the Colorado Golden Demons 10-8 on Tuesday, March 26 for a non-league match. In the first three innings, the Cougars scored five runs against the Demons. Junior John Pashales (#19) scored four RBIs and two runs. 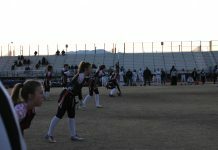 The Cougs went up against Sierra Vista on Wednesday, March 27 and came out on top achieving a 16-14 victory. The Cougs then defeated SECTA with a crushing 16-8 victory on Friday, March 29. The Cougars are now 9-6 and play their next game at home versus Silverado on Tuesday, April 2 at 3:30 p.m. 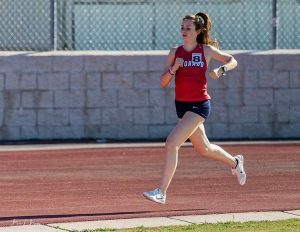 Both the men’s and women’s varsity track and field teams earned first at their Wednesday, March 27 home meet versus Basic, Foothill and Lake Mead. Men’s track and field beat out the competing teams with 131 points. In the 100-meter dash, the Cougs snagged all three top places with sophomore Alex Lopeman taking the lead. In pole vault, senior Keaton Daniels took first at 15’7”, followed by sophomore Josh Banks and senior Kevin Burdalski. Taking first, second, and third in the long jump were seniors Andrew Burdalski, Semaj Bolin and Ai’jalon Bonsu. Coronado excelled in the relays, earning first in the 4×100, 4×200 and 4×400. Women’s track and field earned 151.5 points. In the 100 meter hurdles, senior Emily Wickens and Mentley took first and second. For the 1600 meter run, the Cougs led the pack with junior Claire Rawlins taking first followed by sophomore Ashlynn Hayes and junior Gracelynn Gattis. In the 400-meter dash, Coronado snagged the top three places with freshman Maddie Hoffman in the lead. Coronado also took top three places in the pole vault, triple jump and long jump. Track and Field’s next home meet is on Tuesday, April 2. Previous articleWhat’s the best prank you’ve ever done or had done to you?